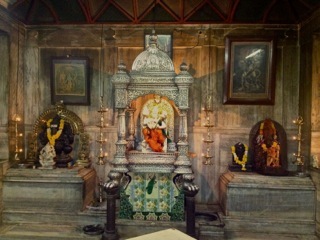 We had the chance to visit the Maruti Temple in the city of Panaji here in Goa. It is a beautiful temple located on top of the Altinho hillock overlooking the Fontainhas district on Panaji which is the capital of Goa. 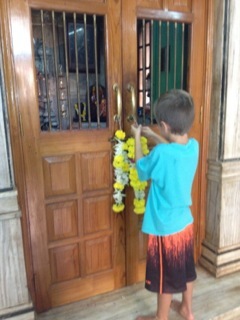 Upon entering we had the opportunity to purchase some flowers (pujas) from the local vendors. One of the ways that we can express devotion is to place an offering or pujas before the object of devotion. Quite simply it is a gift given with good intentions and given selflessly to express gratitude and appreciation. 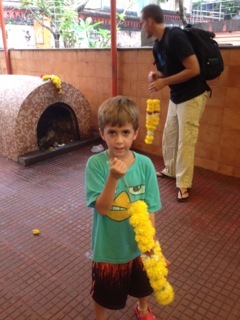 While in one of the smaller temples a tiny sweet Indian woman entered and smiled very graciously. She seemed happy to see us and although there was a language barrier we attempted to communicate. 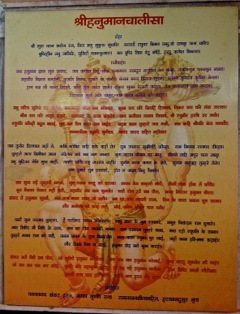 The Hanuman Chalisa was written in Hindi on the wall of the temple and she chanted it for us. So much joy can be found in attempting to understand others’ culture and beliefs. All too often it is easy to see something different from what we know and criticize it or just shy away. By simply opening up to the differences we can begin to see that really there is no difference. This is one reason I love the Hanuman Chalisa. Many thanks to our teacher Tim Miller for opening our eyes to the practice of singing the Hanuman Chalisa. The Hanuman Chalisa is a devotional song sung in the Awadhi language, composed by Tulasidas, a Hindu poet-saint who lived between 1532-1623 CE. The Hanuman Chalisa is inspired by one of the great epic stories originating in India called the Ramayana. It was composed sometime between the 4th to 5th century B.C. It is a beautiful tale primarily of devotional characteristic. Rama, Sita and Hanuman are three of the main characters in the story. Rama is portrayed as the epitome of virtue. Sita, his wife, is portrayed as the epitome of female purity and virtue. Hanuman is the half man, half monkey character who is portrayed as the pinnacle of devotion and selfless service. He has immeasurable strength and is the ultimate devotee of Rama. The ancient mystics of India have long recognized the benefit of cultivating intense love and devotion to aid in the process of realizing unity with the Divine. We are often very self centered and lack a sense of caring and compassion for others. When we live like this we diminish our capacity to feel and experience a sense of harmony with our selves and our environment at large. The yoga practice aids us in cultivating a personal aspect of greater evolution and helps to shift the emphasis of being alone in a world of many to being a part of many that are all a world of one. If we are to make a cake, several ingredients go into the recipe. When we combine the ingredients together and add heat we are left with a delicious treat. Each ingredient needs the other to complete the qualities that make up “cake.” Yoga is made the same way. When we are to enter into the practice of yoga there are several ingredients that create a rich and rewarding experience. We have posture, breath, devotion, love, wisdom and selfless action. We can derive great benefit from cultivating just one of these qualities or practices. However when we begin to incorporate a multitude of these qualities into our lives, we begin to weave a seamless tapestry of moment to moment awareness that is unparalleled to what we think we already know. In other words, yoga practice is much more than practicing asana or posture. It is possible to realize that by extending compassion to others in our speech, thought and deed we are really just enhancing our own relationship with ourselves. When we practice “actionless action,” or karma yoga, we perform action without any attachment to the result of our action. Through this simultaneous merging of qualities our yoga practice becomes what many of us were originally attracted to in the first place. Peace, tranquility, equanimity and transcendence.